The lines of reality and imagination are blurred for these two office workers as the daily grind is interrupted by the unexpected. Bad goes to worse as they are forced to make the most of tough situation… work in an office with no power. Following the instructions of their insensitive employer this work day feels like it might be their last. A hilarious show of slapstick, satire and physical comedy by Poncho Circus. A space that is often boring and unimaginative is filled with unexpected surprises, office supplies like never before and spectacular circus. Poncho Circus are a circus troupe from Victoria and the Australian Capital Territory, Australia. Founded in 2012 the company perform innovative, physical and creative circus shows nationally and internationally. The group combine high level acrobatics, mind-blowing manipulations, comedy, much more to create circus shows that are energetic, hilarious and unforgettable. 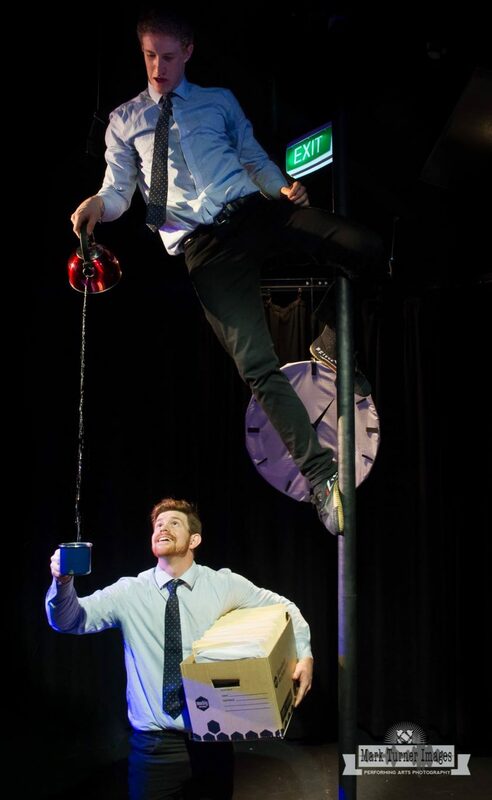 Fresh off their tour with Circus Oz, Poncho Circus founders Jake Silvestro and Lachlan Sukroo are excited to bring their latest production ‘Hardly Working’ to Mullumbimby!